I hope that it's going well. One of the fun things that my daughter and I are doing this summer is "Drawing that Bible Story"! 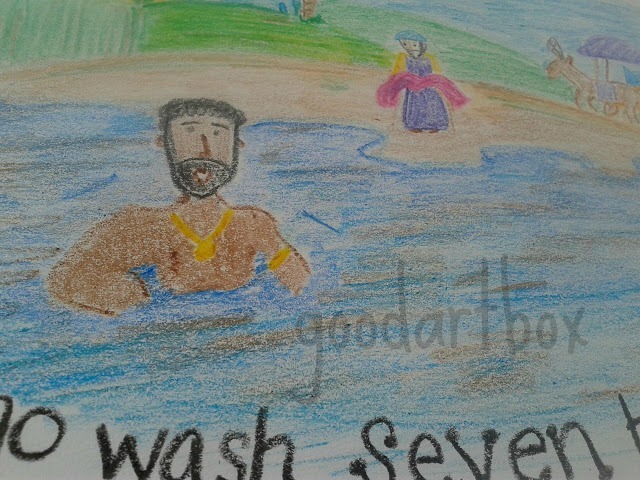 What we do is read a Bible story then draw, paint or color a picture when done. 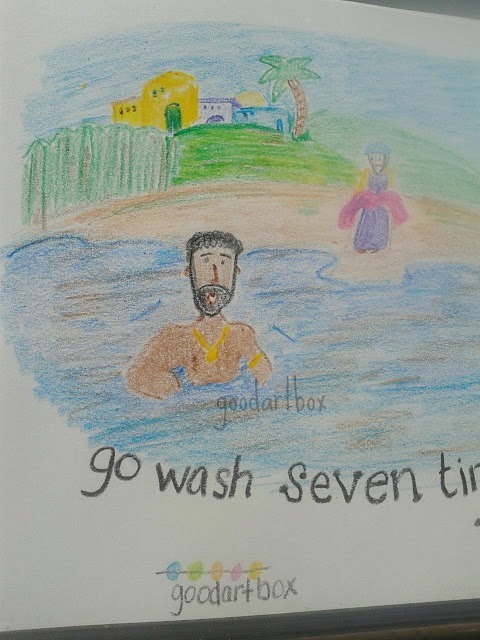 Since the book we used had a very colorful picture of Naaman and his servant at the Jordan, that is the picture we chose to draw. 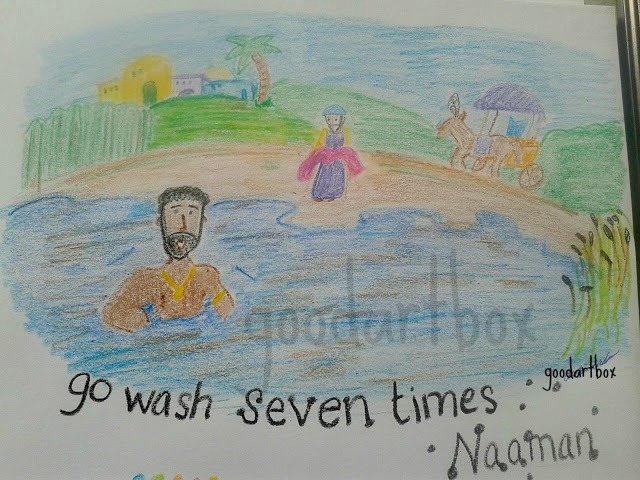 Do you know the story of Naaman? Any kind of disease is awful, but having leprosy was like being dealt a death sentence. 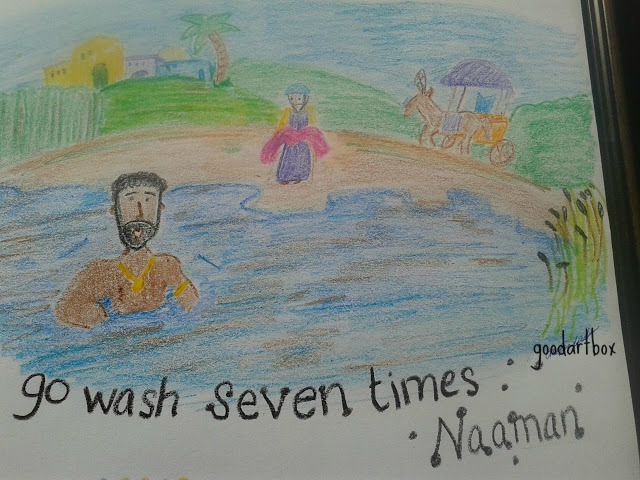 Naaman went to visit Elisha the prophet. That is the story of Naaman. You can find the entire story of Naaman here. So when we finished reading the story we decided to draw out a picture using Crayola Crayons . I wasn't sure how this picture would turn out but I kinda like it! There is a big window in our art room slash homeschool room slash my office that let's in lots of sunshine. So while we reading (and afterwards) we had the added bonus of summer sunlight shining through the window! And since we both love creating - making art, it was like summer fun art! ...and time spent with my youngest daughter is another win! I love having little Bible reminders around the house. ...and this one is sitting on the mantle at the moment. Are you making any art with your children this summer? It is actually a very relaxing and refreshing activity. And of course, you have the bonding thing going on too! So that's another win with creating art with your children. I am trying to make sure that my daughter is creating something daily. ...either with a pen, marker or the ipad.